History Detectives goes in search of a Native American legend. 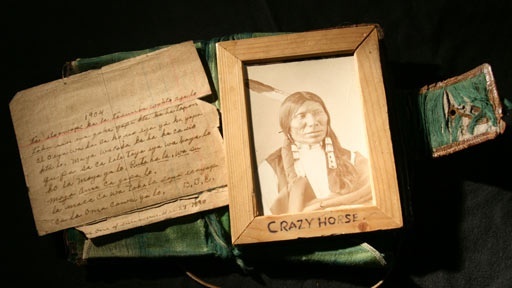 More than a hundred and twenty five years after his death, the name Crazy Horse still echoes in the black hills of South Dakota. In life the Lakota warrior and spiritual man vowed to protect these sacred hunting grounds from encroaching settlers and gold miners. Despite his fame, Crazy Horse refused to be photographed, shunning technology. For years rumors of Crazy Horse photographs have tantalized collectors. More than a hundred and twenty five years after the warrior’s death, History Detectives discovers if a framed image is in fact the only photographic image of this legend. Also in Emerging Modern America: 1890-1930 Lubin Photos What do these photo albums reveal about the birth of the silver screen? Also in Emerging Modern America: 1890-1930 Thomas Edison's House Was this New Jersey home built by inventor Thomas Edison? Also with Elyse Luray Jigsaw Puzzle Does this puzzle depict a real event - women playing contact sports in the late 19th century? Also with Elyse Luray Civil War Bridge Has a new discovery rewritten Civil War history? Related Investigation Marion Carpenter Camera What might this battered camera reveal about a photographer who changed the image of a U.S president?